With 15 months left until the FIFA World Cup kicks off, Russia’s authorities have begun the daunting task of bringing law and order to the country’s sports stadiums. 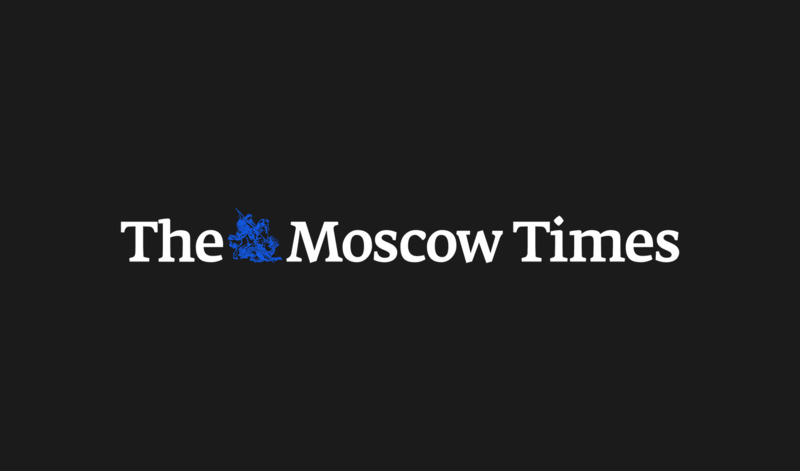 After the world watched Russian football hooligans cause mayhem at the UEFA European Championship in France this summer, Moscow is taking extra steps to avoid similar disturbances in 2018. On Dec. 13, the Federal Security Service searched premises associated with a CSKA Moscow fans group on allegations of extremist behavior. A week earlier, on Dec. 6, the Russian Interior Ministry raided the office of an unofficial fan club for the football team Lokomotiv, in search of for extremist far-right literature. 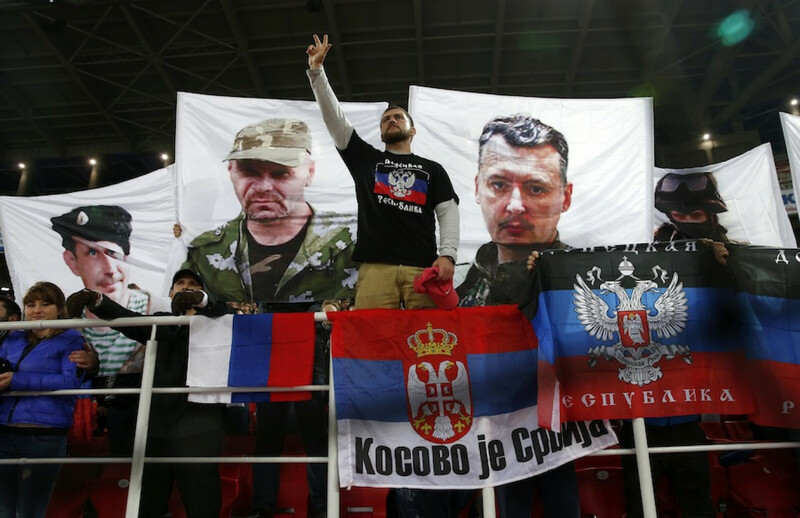 Moscow police also detained four of the group’s members for “inciting hatred” against Albanians at a game between Lokomotiv and the Albanian team Skenderbeu. Both raids are seen as part of an effort by the city’s authorities to tame violent football circles ahead of next summer’s curtain-raising Confederation Cup and the full 2018 games. In public, Moscow brushed off the summer Euro 2016 incidents, and denied that Russian football has a xenophobia problem. Behind closed doors, however, the clashes in France were a wake-up call for Russian law enforcement. With slightly more than a year before the games begin, the authorities are getting serious about putting pressure on violent football fans and hooligans. 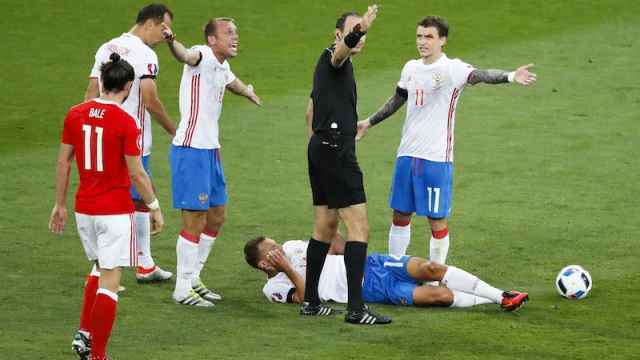 The same week as the raid on the Lokomotiv fan club, Russia’s Foreign Affairs Ministry began registering foreign foot- ball fans with a record of aggressive behavior with the intention of barring their entry to Russia during the World Cup. Russia’s hooliganism scene is far from what it was during its heyday in the 1990s, when Muscovites who lived near a stadium would not leave their homes on game days. “The problems of hooliganism and violence are largely gone from the stadiums,” says Vladimir Kozlov, a journalist who wrote a book on okolofutbol. Today, Russia’s active hooligans resolve disagreements outside the cities, “Usually in forests,” says Kozlov. Russia’s authorities are aware of these tournaments, but they don’t interfere so long as the brawls occur far from stadiums and urban areas. 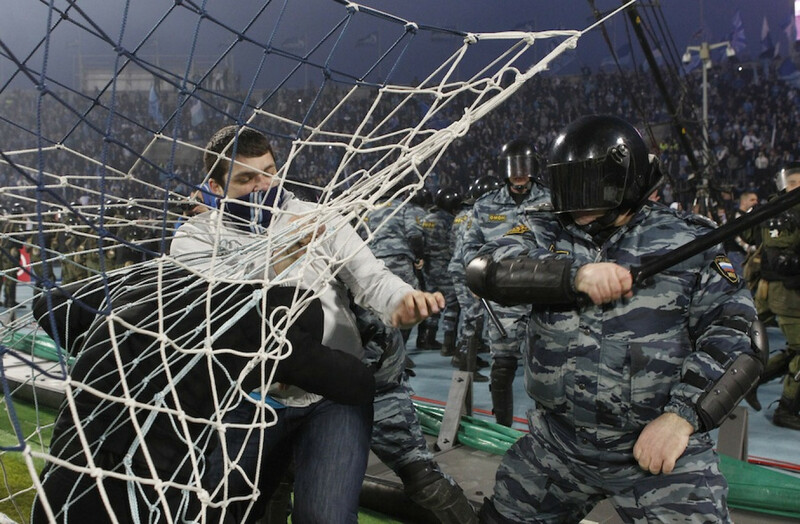 The team infamous for its hooligan culture is Saint Petersburg’s Zenit. According to Kozlov, that side is has the most violent fans “because the club’s authorities have a soft approach towards them.” Zenit even released a re- cent fan commercial showing off its fearsome-looking new regiment of “tsarist guardsmen” who chant during matches. 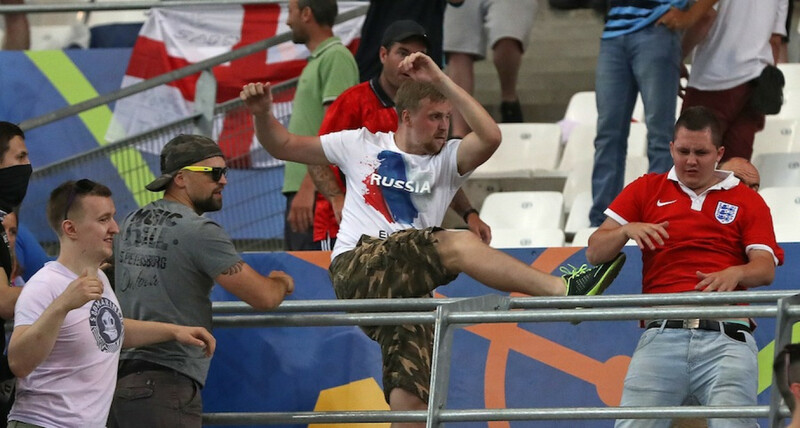 The clashes between Russian and English fans in Marseille this summer has made football hooliganism a global issue. 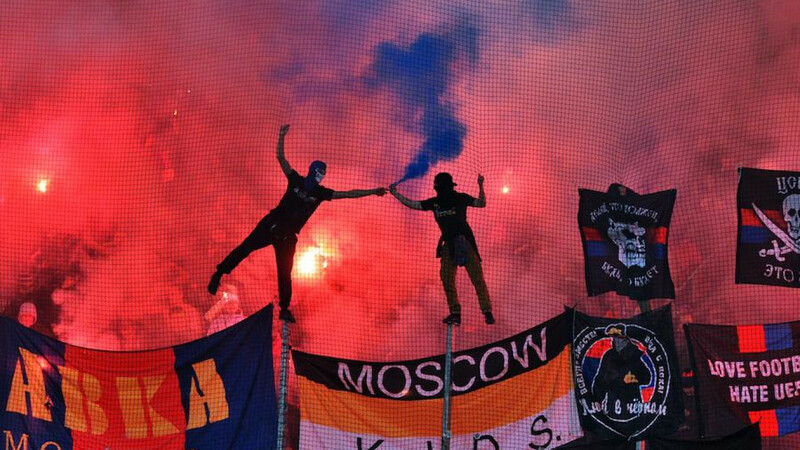 What worries the international community, Klymenko says, is that Russian state-backed football organizations are run by well-known hooligans. For example, one of the men arrested in the clashes was Alexander Shprygin, the head of the All-Russian Supporters Association, an official fan organization connected to the Russians Sports Minis- try. Shprygin was among 20 Russian citizens detained and deported by French authorities. Shprygin was later arrested in Moscow and the All-Russian Supporters Association was disbanded. Today, a court is reviewing the organization’s legality. Even the Russian Sports Ministry has distanced itself, saying it can no longer support the group despite having helped found it. In December, Markin was appointed the head of a Russian state committee for Security and Fan Relations. a peaceful championship,” he says. Speaking anonymously, a Lokomotiv fan confirmed that the authorities have stepped up pressure on “active” fans. “Many stay at home for fear of the police,” he said. Racism inside football circles is far from unique to Russia. But racism is a particular problem within Russian society as a whole. At sports stadiums, it falls under a magnifying glass. “A guy sitting at home watching the game could be just as racist, but nobody sees it,” says Kozlov. Russian police are finally beginning to crack down on far-right activists and their ties with football hooligans. On Oct. 21, two weeks before nationalists’ annual parade, “Russian March,” the authorities arrested Dmitry Demushkin, the former leader of the now banned “Russians” movement. Before heading that outfit, he led the skinhead group “Slavic Union,” until it, too, was banned. 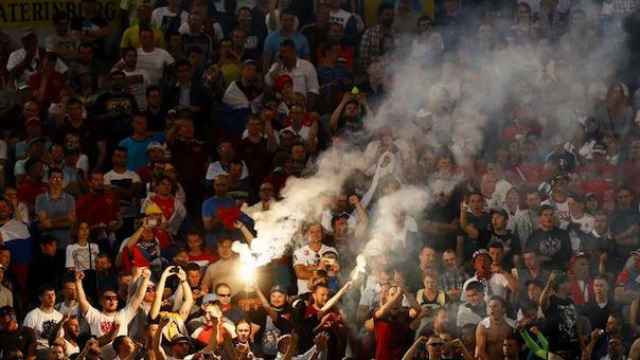 There have been government efforts to deal with xenophobia and hooliganism in Russian stadiums. The so- called “Fans Law,” aimed at curtailing football violence, has been in place since January 2014 but its effect are yet to be seen. On game days, there are still frequent reports of attacks against people of non-Russian appearance on pub- lic transport. Assailants in these incidents often shout racist slogans, like “White coaches!”. Through explicit slogans, like “Football fans are not criminals!” and “The stadium is not a prison!”, fans have collectively protested against stricter regulations enforced in Russia’s stadiums. The racism problem in Russian football is more prevalent in lower-league teams, since the bigger clubs are more closely monitored. Klymenko expects that major cities like Moscow, St. Petersburg, and Kazan will be well policed in 2018, with little abuse of ethnic minorities. 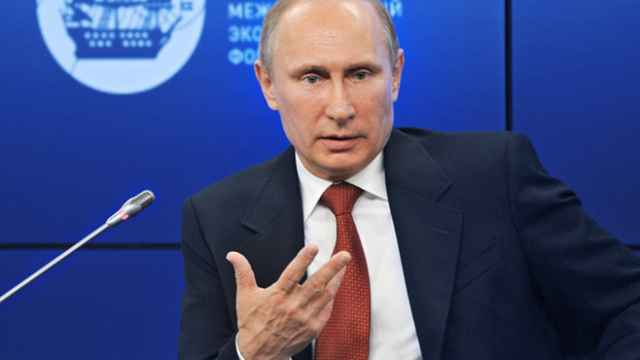 “We expect the incidents to happen in Saransk and Yekaterinburg,” he says. As Russia builds up its stadiums in 11 cities, from Kaliningrad to the Urals, the federal government is focusing its efforts on supporting regional authorities inexperienced in policing international football games. In a bid to ensure law and order, Russia will even re-introduce drunk tanks — Soviet-era isolation rooms for intoxicated individuals — for the duration of the World Cup. Each region will be able to choose whether these sobering rooms will fall under the control of the local police or hospitals. While foreign and Russian fans may be temporarily detained for drunkenness at matches, it’s what happens outside the stadiums that will be harder to control.